Web Power Switch! - 15 Day Free Trial! - Ships Overnight - From $109! • Easy to use. Easy to set up. Clean web interface. • Secured WiFi and wired Ethernet. • Multi-target AutoPing reboots routers & modems. • HTTPS, SNMP, Rest API, SSH, SSL, Echo/Alexa & more. • Lua scripting language for customizing. • Powerful 32bit CPU with watchdog adds reliability. • Oversized 40A relays and power supply. 4x beefier than competitors. • Detachable 15Amp 6 foot cord or order a custom length. Use the simple, clean web interface right out of the box ...or customize it using the built-in scripting language. The Pro is completely stand-alone. No cloud service or subscription needed. Try yours risk-free for 15 days. Call (408) 330-5599 for quantity discounts, expedited shipping, and international orders. Need something else? 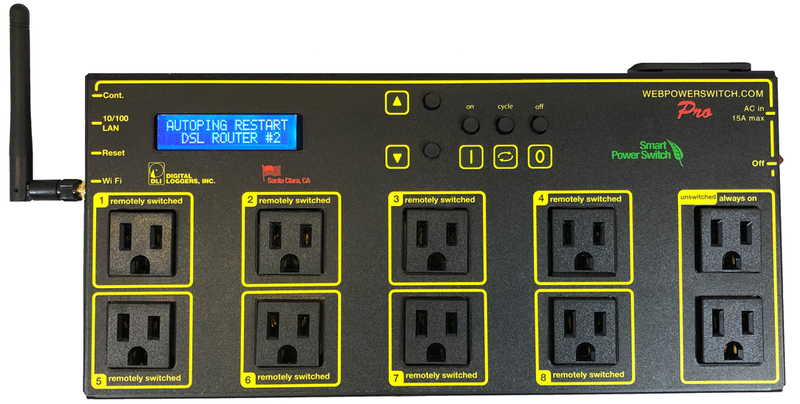 DLI also builds PoE Injectors, Rack-Mount PDUs, DC Power Switches, 80-240V switches and DIN relays. And, yes.. Rest assured, we are an American company with US quality control. You won't be needing it, but the Pro is backed by a full 5 year warranty.